Construction of the plant was an engineering feat like none before it. Baker decided the best way to protect the power generating equipment from the wet winters and spray from the falls was to build it underground. Working from the river’s edge both above and below the falls, crews began drilling horizontal and vertical shafts into the bedrock. Where the shafts met, 270 feet below ground, they carved out a cavity to house the generators and turbines. Once the equipment was in place, water was diverted down the vertical shaft, where it turned four behemoth turbines and drove the electric generators before returning to the river via the horizontal shaft. When complete, the power plant produced 6,000 kilowatts of power, enough to provide electricity for the Seattle streetcar system, two flour mills, and lighting for six cities. More than a century later, the original Snoqualmie Falls power plant, along with a second, larger plant just downriver, continues to generate clean, cost effective electricity for Washington homes and businesses. The waterfall itself has become a popular tourist attraction, with the adjacent Salish Lodge hosting hundreds of weddings and events each year. 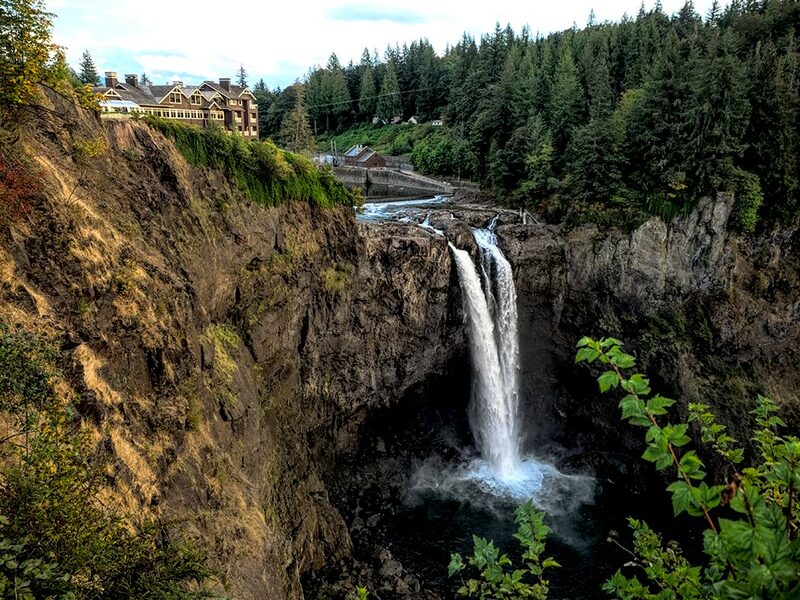 If you enjoyed this article about Snoqualmie Falls, you may also be interested in my story about the quietest place in the U.S., located in the Hoh Rain Forest at Olympic National Park in Washington State. I live in Washington state and have visited Snoqualmie Falls many times. Palouse Falls in southeastern Washington also is worth seeing. Do you know about the rolling hills of the Palouse region, wheat country? It’s worth visiting. No, I didn’t Rita! But I do now, and I’ve added the Palouse region to my travel wish list. Thank you. I was there last May and the water was pouring over the falls at pretty much full flow. It was truly spectacular. Hope you’re enjoying your visit. Go check out Wallace Falls if you haven’t already. Hi Al: I’ve already moved on, but I have friends in the area so I’ve made a note of it for next time. Thanks! Yup, renewable energy is better than fossil fuel. Liked your blog, especially the design. As usual I enjoyed your article. Just one small thing you may want to correct regarding the output of the original plant. I believe that plant had 4 turbines each capable of 1.5 MW (megawatts) so the total output would be 6MW (6,000,000 watts). Oops! Hi Joe. I meant to say 6,000 kilowatts, not 6,000 watts. Thanks for the heads up; I’ll change it in the article.